For the past few years, [Father Theophane Gonnelly] had been living with the Servants of the Paraclete in Jemez Springs, New Mexico and more recently with them in St. Louis. 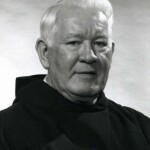 Our confrere, Father Theophane Gonnelly, OSB, died in a St. Louis, Missouri hospital on January 26th. His funeral Mass and burial were at the abbey on February 4th. Father Theophane was born in Wilmington, Delaware on February 14, 1921. He was living in Atlantic City, New Jersey in 1942 when he entered St. Meinrad’s Archabbey. Father Theophane was ordained to the priesthood there in 1947. A musician by profession, he played in a dance band before joining the monastery. Father Theophane conducted the St. Meinrad Symphony Orchestra and the Chancel Choir. In 1952 he was assigned to Blue Cloud Abbey where we was the choirmaster, organist, and a teacher in our seminary. With the introduction of the vernacular into the liturgy, Father Theophane composed English hymns, antiphons, and “The Mass on an Indian Theme” for the Blue Cloud community. The Indian Mass became very popular and was sung in many places throughout the country. Father Theophane served at the two North Dakota Indian missions formerly staffed by the monks of Blue Cloud: St. Michael’s and St. Ann’s. In 1979, Father Theophane became the Chief Judge and Director of the Marriage Tribunal for the Diocese of Sioux Falls. In 1988, he was recalled to Blue Cloud Abbey. Here in the abbey, he had served as the community’s treasurer, archivist, and chronicler. He was precise in whatever work assignment was given to him. He was a good teacher and preacher. And he was a magician, performing for the youth at our summer camp and at the missions. For the past few years, he had been living with the Servants of the Paraclete in Jemez Springs, New Mexico and more recently with them in St. Louis. We ask the members of our monastic congregation and all other Benedictines to remember Father Theophane in their prayers for the deceased. 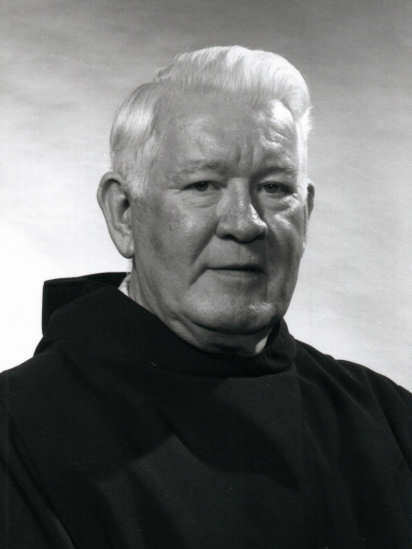 On this day in 2005, our confrere, Father Theophane Gonnelly, OSB, died in a St. Louis, Missouri hospital. He had been a resident in a facility staffed by the Servants of the Paraclete, having recently moved to St. Louis when their house in Jemez Springs, New Mexico was closed. His funeral Mass and burial were at the abbey on February 4th. Father Theophane was born in Wilmington, Delaware on February 14, 1921. He was living in Atlantic City, New Jersey in 1942 when he entered St. Meinrad’s Archabbey. Father Theophane was ordained to the priesthood there in 1947. A musician by profession, he played in a dance band before joining the monastery. Father Theophane conducted the St. Meinrad Symphony Orchestra and the Chancel Choir. In 1952 he was assigned to Blue Cloud Abbey where he was the choirmaster, organist, and a teacher in our seminary. With the introduction of the vernacular into the liturgy, Father Theophane composed English hymns, antiphons, and “The Mass on an Indian Theme” for the Blue Cloud community. The Indian Mass became very popular and was sung in many places throughout the country. Father Theophane served at the two North Dakota Indian missions formerly staffed by the monks of Blue Cloud: St. Michael’s and St. Ann’s. In 1979, Father Theophane became the Chief Judge and Director of the Marriage Tribunal for the Diocese of Sioux Falls. In 1988, he was recalled to Blue Cloud Abbey. Here in the abbey, he had served as the community’s treasurer, archivist, and chronicler. He was precise in whatever work assignment given to him. Although he had a sense of humor, there were times when he could not tolerate levity. At Divine Office he once threw an antiphonale at a candidate whose behavior had upset him. His funeral Mass and burial were at the abbey on February 4th. Cremated in St. Louis, the ashes were held up in the mail and did not arrive at Blue Cloud until the morning of the funeral.